June 27, 2009 - PRLog -- Reuters reports that, the International Air Transport Association (IATA) has announced that it would achieve carbon neutral growth from 2020 through a combination of investment in technology, biofuels and economic measures such as carbon trading. Airlines also project that carbon trading will cost the industry about $7 billion from 2020, based on a carbon price of $65 a metric ton in 2020. Some US airlines have reduced their flights in response to plummeting demand for travel and freight, and carriers in Asia and Europe are likely to make similar scheduling cuts to allay their operating costs, according to IATA, which estimates the airline industry will lose $9 billion this year. In the United States, Northwest Airlines has excluded spoons from its cutlery pack if the in-flight meal does not require one. "When you are talking about a jumbo jet with 400 people on board, being served two to three meals, this can save a few kilos," they said. American Airlines said fuel-saving measures have helped it save more than 110 million gallons of fuel annually and reduced its carbon emissions by 2.3 billion pounds in 2008. It aims to save 120 million gallons of fuel and reduce carbon emissions by 2.5 billion pounds in 2009. Another carrier, JAL of Japan, took everything it loaded from a 747 and put it on the floor of a school gym to see what it really needed. As a result it shaved a fraction of a centimetre off all its cutlery to cut weight. Other carriers have come up with all sorts of ingenious initiatives to shift the flab off their aircraft. In-flight magazines are going and carriers are even putting their duty-free catalogues onto the seat-back televisions. Catering trolleys are becoming lighter and less water - both bottled and in the tank - is being loaded. The next generation of aircraft seats is likely to be up to 30 per cent lighter than the current generation, with composite replacing aluminium. Reinforced carbon fibre is used for the shields for the in-flight televisions, cutting the weight by as much as half. At the same time the industry is looking to step up the use of alternative carbon-free bio-fuels, which should account for up to six per cent of the industry total by 2020. A number of carriers, including Virgin Atlantic, Continental and Air New Zealand, have carried out trials of alternative fuels. Up to 100 European airports are also preparing to change their standards on planes landing procedures, shifting to a "continuous descent approach", or CDA, that makes for a smoother descent and cuts carbon emissions by 160 kg to 470 kg per flight. These plans add to the financial crisis currently faced by the airlines industry. IATA, representing 230 airlines, estimates a $9 billion loss for the airline industry in 2009 on top of a revised loss of $10.4 billion in 2008, reports Space Daily. The organization also said that the industry spent $165 billion on fuel in 2008, representing 31 percent of costs. IATA also restated the industry’s previous environmental goals to cut absolute emissions by 50 percent by 2050, and improve average fuel efficiency 1.5 percent annually between now and 2020. 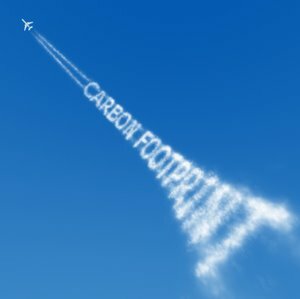 Airlines will reduce their carbon emissions by nearly 8 percent this year as they slash the number of flights they operate in line with a drop in cargo and passenger demand, and about 6 percent of the forecast carbon cut will come as a result of carriers flying fewer planes in 2009, and a further 1.8 percent reflects steps to improve energy efficiency, the International Air Transport Association (IATA) said. Carbon emissions are one of the prime contributors to global warming and the efforts by the airline industry are just the "tip of the iceberg", but at least it is a start.